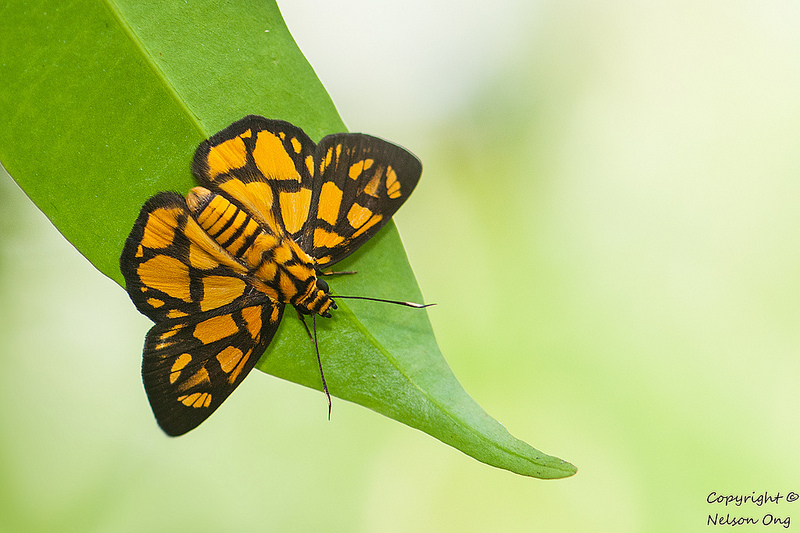 This pretty black-and-orange skipper is moderately rare, but is widespread in distribution across Singapore where it can be found regularly in urban parks and gardens as well as in the forested nature reserves. At certain times of the day, it zips around rapidly, sometimes in dogfights with another individual of the same species. It has a habit of flying and then hiding on the underside of a leaf with its wings opened flat. The caterpillar of this butterfly feeds on Erycibe tomentosa and its life history has been recorded here. This Hieroglyphic Flat was shot by ButterflyCircle member Nelson Ong last weekend after the skipper had its fill of the nectar from a flowering Syzygium tree. At times, the skipper can be found feeding on bird droppings on the forest floor or on leaves. It will return time and again to its food source even when disturbed.